As Thailand lost the ancient city of Ayutthaya to flood waters and central Bangkok braces itself for a possible inundation this weekend, I can't help but feel anxious for the fate of my favouritest holiday destination. When Ayutthaya went underwater and I saw images of how whole villages were submerged, my heart sank. Declared a UNESCO World Heritage Site in 1991, I had wanted to revisit this historical Thai suburban town during a trip to Bangkok just a couple of months back. But I changed my mind at the last minute because my travel buddy didn't want to go when I thought he wanted to. My motivation was dashed and so I decided to postpone the excursion till my next Bangkok trip. Facing its worst monsoon barrage in over 50 years, the current situation in Thailand has flooded (pardon the pun) our newspapers' headlines and became a focal point of the region and the United Nations as fears of food shortages mount in the face of widespread devastation to Thai rice farms. Global businesses also added a few more worry lines as factories based in flood hit districts came to a standstill. But my concern is how much of history will be washed away when the monster tide finally recedes? This irrepressible flood reminded me that even though ancient sites have survived the centuries, they still run the risk of being here today, and gone tomorrow with our increasingly volatile climate. So if there is somewhere we want to go or something we want to drop our jaw of in person, don't procrastinate. 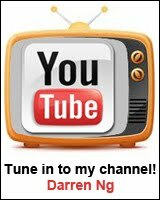 Make plans and go see them soon! 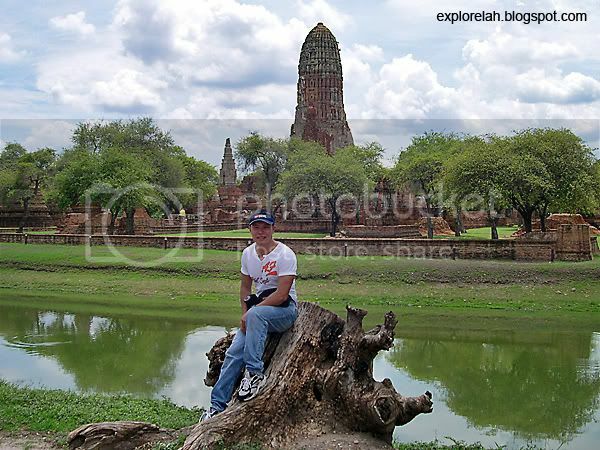 My seed for a return visit to Ayutthaya was sown a day after my birthday in 2005. I wanted to do something memorable for turning 31 so the day trip happened. Back then, I didn't know photography like I do now and armed only with an aging Nikon Coolpix 4300 (the first digital camera I owned) I set out to do photographic injustice to this place. At that time, it was all about exploration and experience, not so much of getting nice pictures. 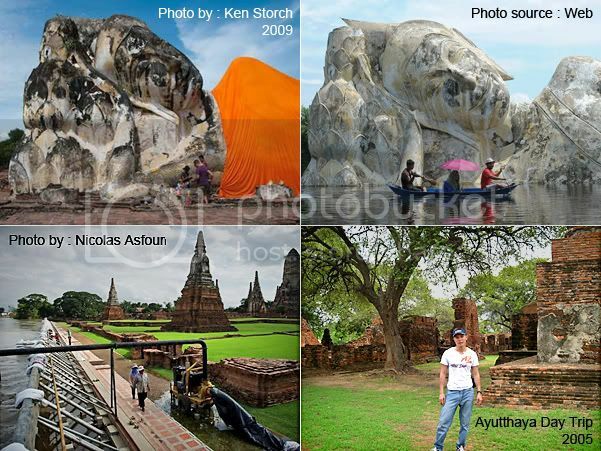 That's why I wanted to go back again to photograph Ayutthaya. It was also because the battery of my Coolpix 4300 died on me and I didn't capture as many shots of the temple ruins as I wanted to. I remember my camera was in a very sad state. The catch of the battery cover had broken off so I held it in place with wads of sticky tape. Plus my travel companion wasn't too patient with me taking forever to frame a photo. Thankfully, some of the shots turned out okay. Phra Chedi Chaimongkol. 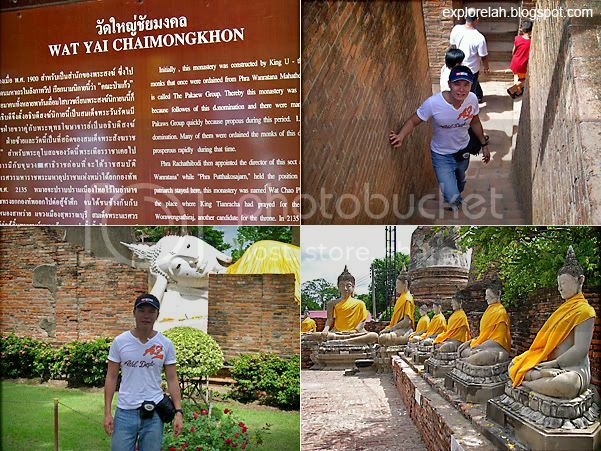 The monastery was built in 1357AD by U-Thong, the Thai warrior-king who led Thailand to independence. You can climb up to the central prang but there's not much of a sight within the bell dome. 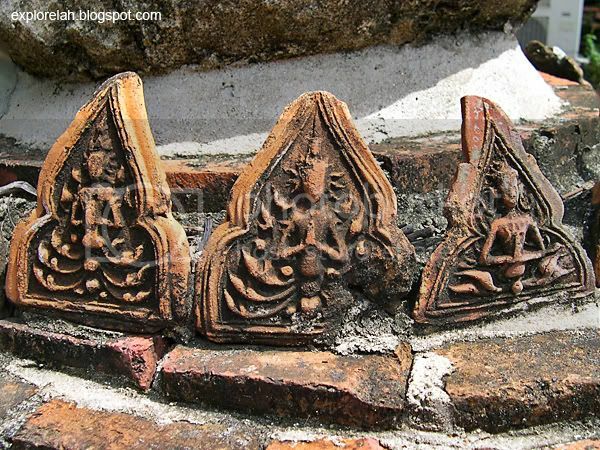 Ayutthaya, also spelt Ayudhya, was one of the most powerful capital cities in Southeast Asia between 1347 to 1767. Thailand was known as Siam then. Today, remanants of the royal city form an outdoor historical park that hints of the glory that once was. 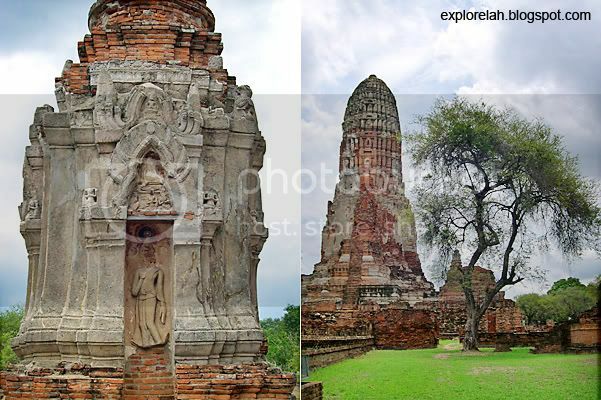 Ayutthaya is about 2 hours from Bangkok city centre by car / van. 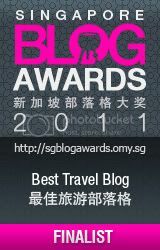 I took a day trip with a tour operator in Bangkok and it cost 2,000bht per person in 2005. The day trip's itinerary started with a visit to the Summer Palace followed by a long tail boat ride (additional charge of 300bht) down Chao Praya River passing by waterside villages, a visit to Wat Yai Chaimongkhon, elephant camp, time for free exploration and a boat ride down Chao Praya River back to Bangkok city. High-tea buffet was served onboard the boat. A couple of my friends went during end July 2011 and they chartered a taxi for a day to take them there. 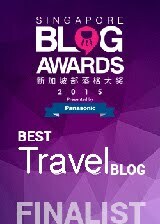 The cab picked them at their hotel at 8.30 am and they were back in the hotel at 6.00 pm. The full day booking fee was 1,500bht and the cab driver took them to all the popular temple ruins within Ayutthaya's historical park. He spoke little English so don't expect a running commentary about the sights. But I think that's a really good deal if it's spilt between 2 - 4 friends. 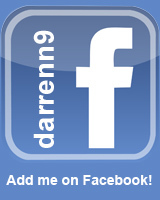 I've not tried the cab driver's service, but my friends called this number to make their booking - 081-939-7398. The driver's name was Tiger. I think any cab would be happy to be chartered for a day. Just negotiate a price and it should be around 1,500bht. 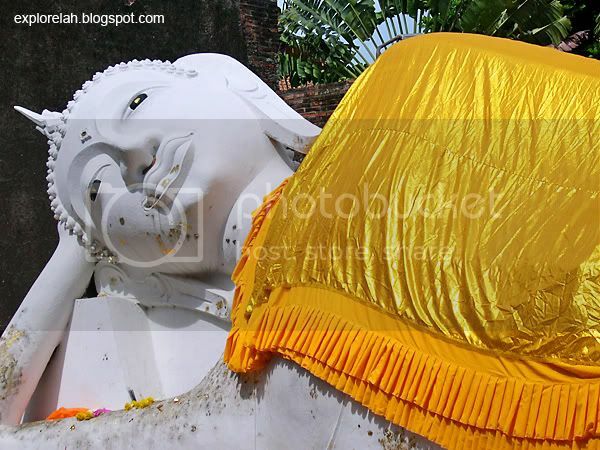 Reclining Buddha within a ruined vihara. 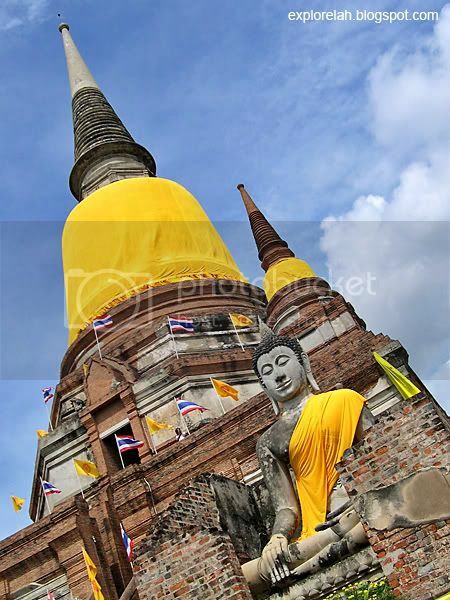 Restoration of Wat Yai Chaimongkhon started in 1965 and the temple still functions as a place of worship and meditation for devotees. 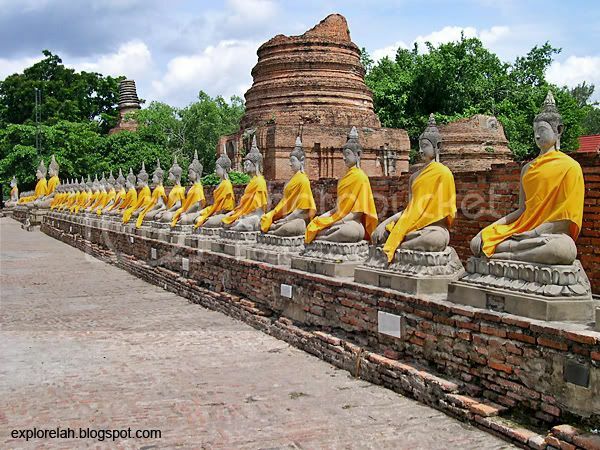 My 2005 Ayutthaya visitation coincided with Vesak Day so all the Buddha statues were lavishly dressed in bright yellow robes. 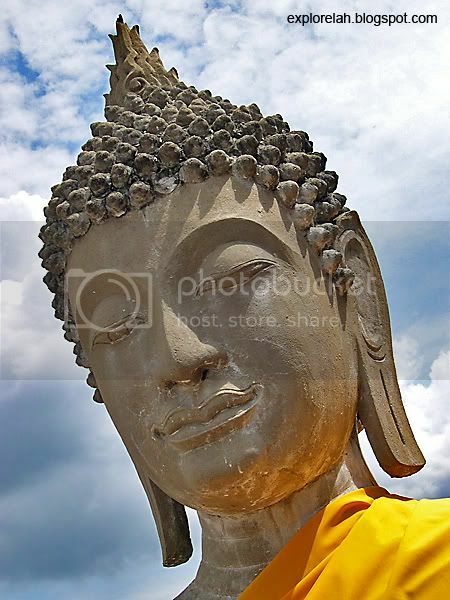 In Buddhism, yellow is the colour of earth and represents rootedness and renunciation of worldly desires. 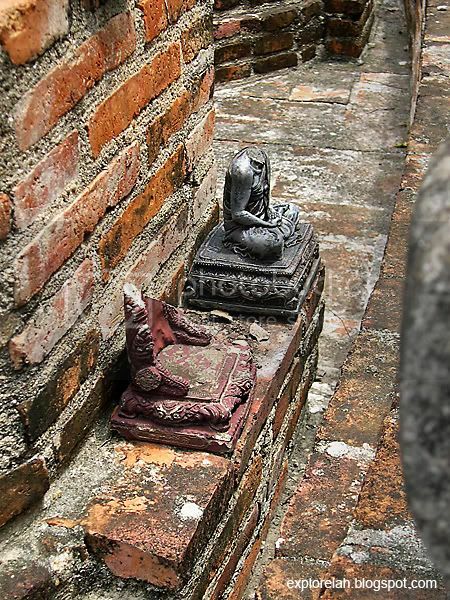 Hundreds, if not thousands of these Buddhist statues litter every nook and cranny of the temple's grounds. I wonder if they will still be there after the flood. 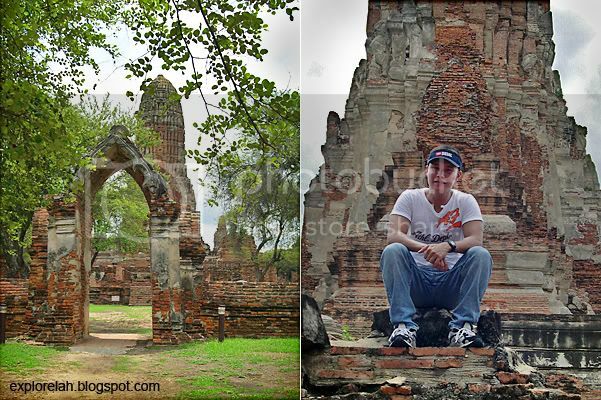 As mentioned, there are quite a few ruin sites to explore in Ayutthaya's historical park. I didn't have a lot of time for free exploration so the other only ancient temple I visited other than Wat Yai Chaimongkhon was Wat Phra Ram (Temple of Rama). An fee of 20bht is collected at the entrance. 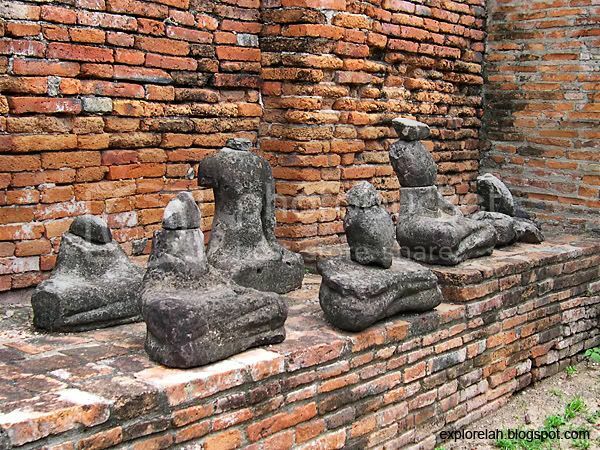 The highly decorative phallic shaped prang of Wat Phra Ram and the carvings on its walls have strong influences from the Khmer (Cambodian) style of temple architecture. 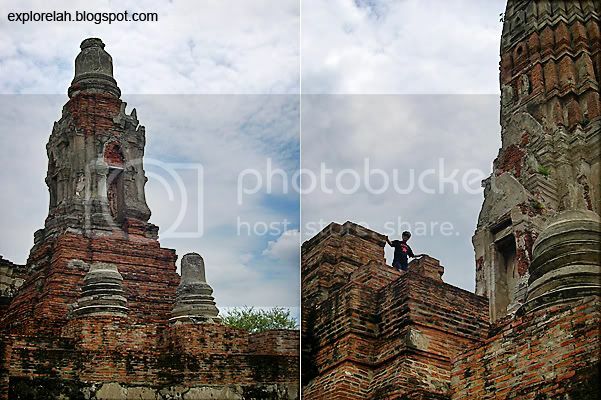 When visiting Ayutthaya, be prepared to walk alot as the ruins are pretty far apart. So the chartered taxi idea may be better to save the time spent on foot. 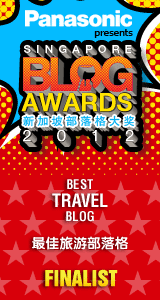 It could also get very hot so wear sunscreen and bring along an umbrella and fan. 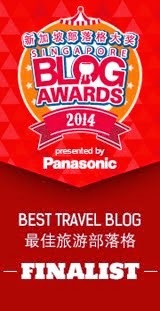 I was sweat-drenched the moment I arrived in Ayutthaya until I left. There can also be quite a bit of climbing and the steps can be hazardous as they are rather narrow and steep. No barricades or safety railings. Climb and explore upper portions of temple ruins at your own risk. Wow, check out my tricep back then! Though already eroded, one could still imagine how intricate and beautiful these reliefs must have been. A lower courtyard in the Wat Phra Ram ruins that's lined with what's left of lifesize Buddha statues. 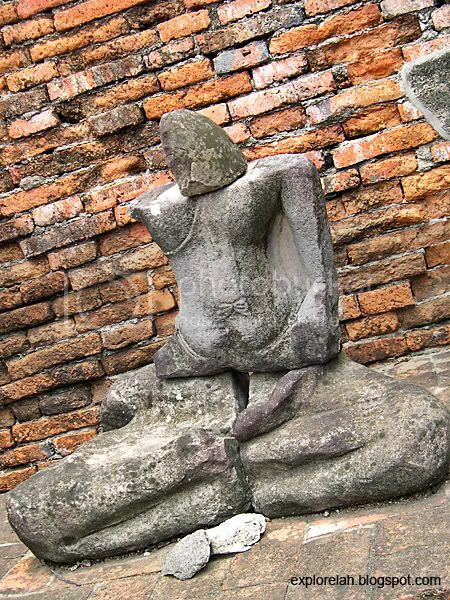 Even if the statues had been greatly disfigured, it seems that the Thais still hold any stone that had once been part of a sacred image with reverence. I hope they don't get lost to the flood tide. One of the sights I didn't get to see during my last visit was the Buddha head clutched within the intertwined trunks of a tree at Wat Mahathat. The head gets raised a few centimeters every few years as the tree grows. 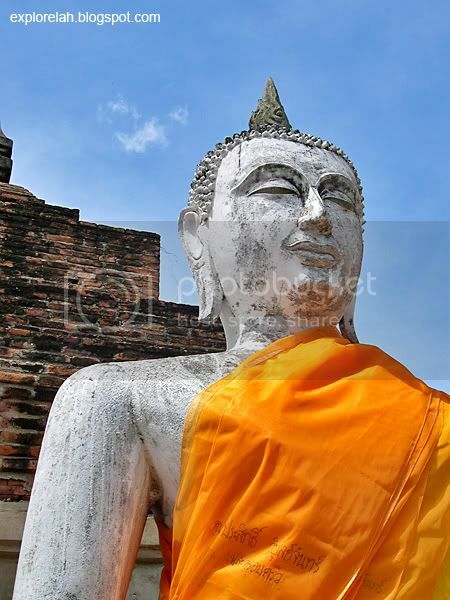 It is perhaps the most widely photographed and iconic image of Ayutthaya. 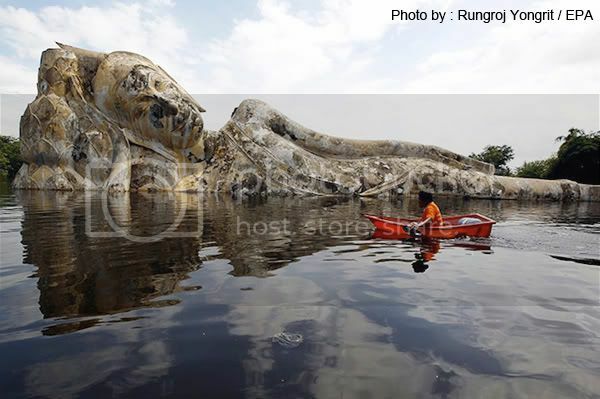 I wonder how long Bangkok will take to be reinstated after the flood. 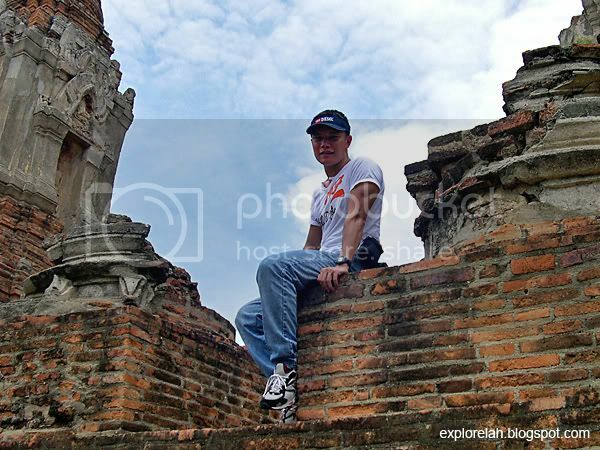 And the next time, I'm so going to Ayutthaya again before unpredictable forces horde it again. 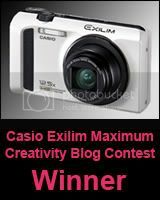 You have really nice pictures ! I went to Ayutthaya one month ago and I was happy to see that tourists are coming back and the city is living normally again.